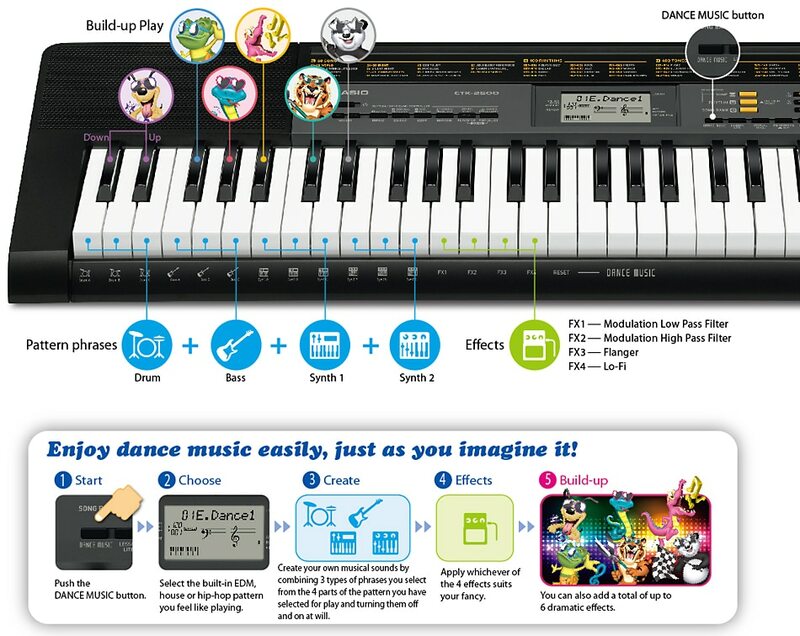 Easy dance tune playback - Just touching the keys is all it takes to play dance music expressing a DJ mood. Or you can use Build-up Play to apply sound effects characteristic of dance music for even more fun. Pressing the indicated black keys livens up the music with six dramatic sound effects! Add to the fun by linking the keyboard with the downloaded Chordana Play app in your smart device. Use an audio cable to transfer 50 built-in songs from the app as well as songs downloaded as MIDI files and save them in the keyboard. You can then use the saved song data with the keyboard accompaniment function to enjoy the Step Up Lesson feature. Songs stored in the keyboard may sound different from original built-in songs. PROMRNADE FROM "TABLEAUX D'UNE EXPOSITION"
A piano roll showing the music score and finger timing is displayed on the mobile device’s app screen. Built-in songs cover a wide range of genres for lesson play and for your listening enjoyment. An advanced Auto Accompaniment feature provides you with access to a large collection of ethnic rhythms from around the world, with a special emphasis on Latin rhythms. For the latest news about driver and application support under Windows®7, visit here.